EOS is the sixth largest coin in the world by market capitalization, with a total token supply worth almost $5 billion at this time. As the use of blockchain and decentralized applications in the mainstream increases, the EOS coin could easily rise even higher in value. The coin already threatened the market leaders in April of 2018, when it briefly broke past $21. You can read the UseTheBitcoin EOS price prediction article for more analysis. Read ahead for a guide on how to buy EOS coins on the popular Binance exchange. Created by the company Block.one, EOS is a platform very similar to Ethereum. As a smart contract platform, all kinds of users are able to build blockchain applications on the EOS network. The aim is to be more flexible and scalable than the Ethereum network. The hallmark of EOS thus far has been its token sale, which lasted almost a year and raised more than US$4 billion, making it by far the biggest token sale conducted to date. At the same time the token sale finished in mid-2018, the team launched the EOS mainnet and ran a token swap from the ERC20 placeholder tokens to native EOS tokens. Since then, several dApps and ICOs have already been launched on the EOS blockchain. Now let’s see how you can buy your first EOS tokens. This guide will go through how to buy EOS tokens on the Binance exchange with BTC or ETH. At this point, very few exchanges have EOS and Fiat pairs available. If you haven’t already, the first step is to create a Binance account. The process should be quick and easy and is open to people almost anywhere in the world. Before you can start trading, you will need to submit several verification documents to the Binance team. Also, take this opportunity to set up security measures for your account, such as 2-Factor Authentication. Once your account is set up, send some BTC or ETH coins to your Binance wallet. If you don’t have either of these two coins, or you want to invest more into crypto, you can buy crypto with a credit card from several sites, such as Coinmama or Changelly. 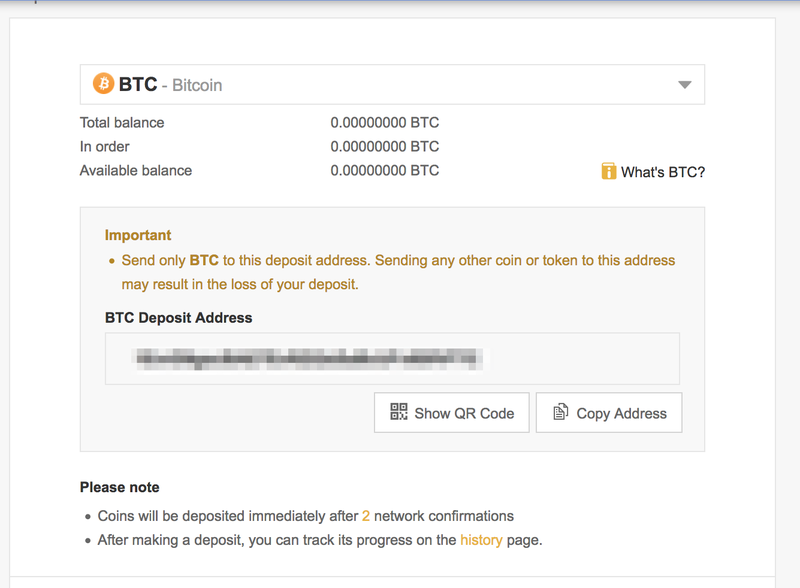 To make a deposit, go to the top of your page and select “Funds”, then “Deposits”. Choose which coin you’re going to deposit from the dropdown menu. Now you’ll be given a wallet address to send your coins to. Make sure you only send the specified coin (i.e. BTC to the BTC wallet, or ETH to the ETH wallet). Any other coins you send here may be lost. Depending on the network load, it may take a little while for your transaction to go through. Wait until Binance confirms the transaction has been successfully completed before advancing. Once the coins are in your Binance wallet, move to the exchange section of the site. To get here, go to the top of the page and select “Exchange”, then “Basic”. Now go to the right side of the page. Select the coin you’re going to trade with (BTC, ETH, USDT or BNB) and type EOS in the search bar. Click on the pair that comes up (e.g. EOS/BTC or EOS/ETH). In the trading section, Binance offers a lot of tools and data to help you trade smarter. They have price and order history and live, customizable price charts. You can also perform limit orders. With limit orders, you set the price at which you want to buy (or sell) EOS, in relation to BTC/ETH. Once the price hits that point, Binance will execute your order. Below the price graphs, choose how much EOS you want to buy. Set the price at which you wish to buy, or select “Market” to buy at the current price (this is recommended for novice traders). Hit the green “Buy EOS” button, and you’re done! The best practice in crypto is to keep your coins in a secure wallet, off an exchange, when not trading. That way you have full control over the security of your tokens, as opposed to trusting the security measures of the exchange. To do this, you will need a crypto wallet that supports EOS. The SimplEOS wallet and the Greymass eos-voter wallet are two desktop wallets made just for EOS. Alternatively the Infinito wallet is a mobile wallet for Android and iOS which supports a number of different coins. For the highest level of security, you may want to invest in a hardware wallet such as the Ledger Nano S.
To withdraw your EOS tokens from Binance, go to “Funds”, then “Withdrawals”. Choose EOS from the dropdown menu. Next put in the wallet address from your EOS wallet, as well as the amount of EOS you want to move. Double check the address is correct and hit Submit. ….and that’s it! All you need to know to start investing in the EOS ecosystem.